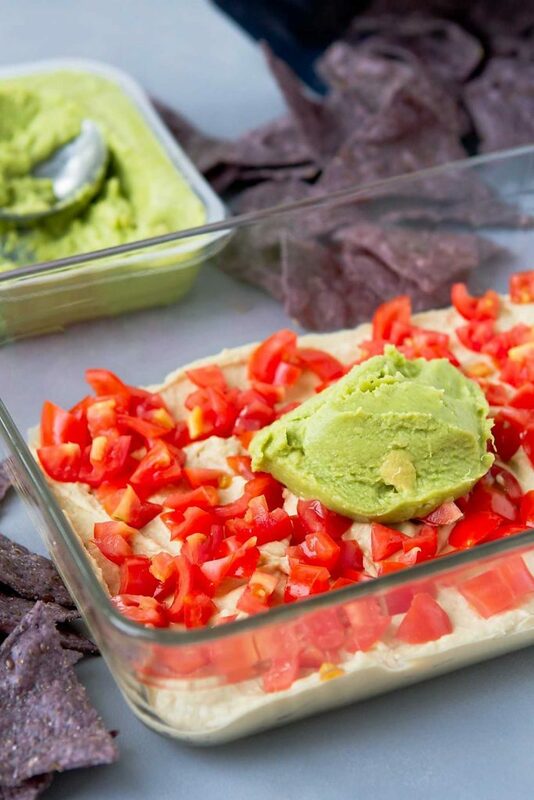 Give your game day or regular afternoon snacking a makeover with this Healthy Quinoa Guacamole 7-Layer Dip. So simple and delicious! 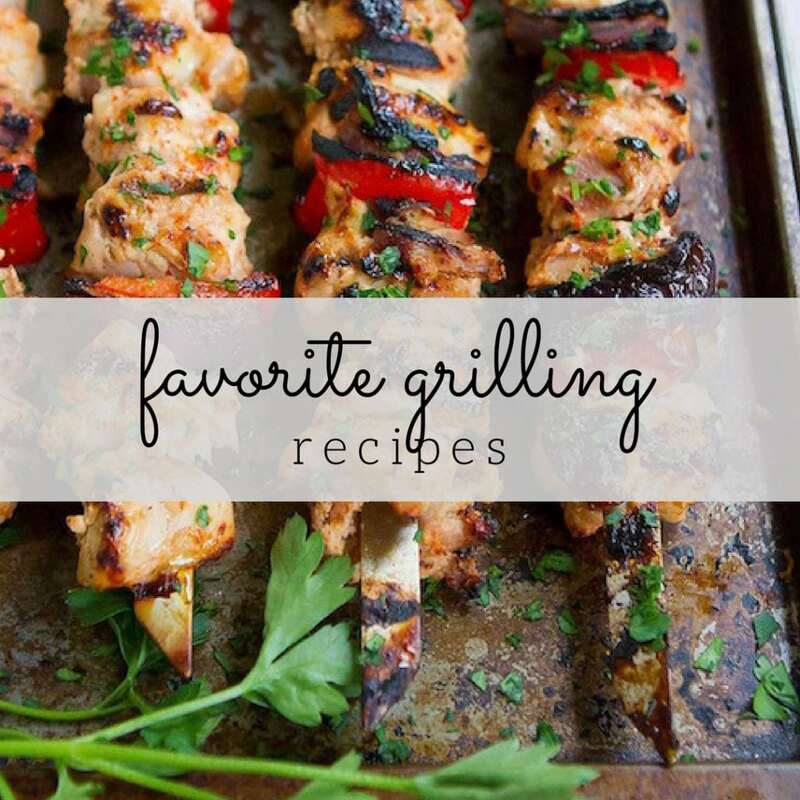 Thank you to Albertsons and Safeway for helping me share this recipe with you. As a healthy food blogger, January is a glorious time! 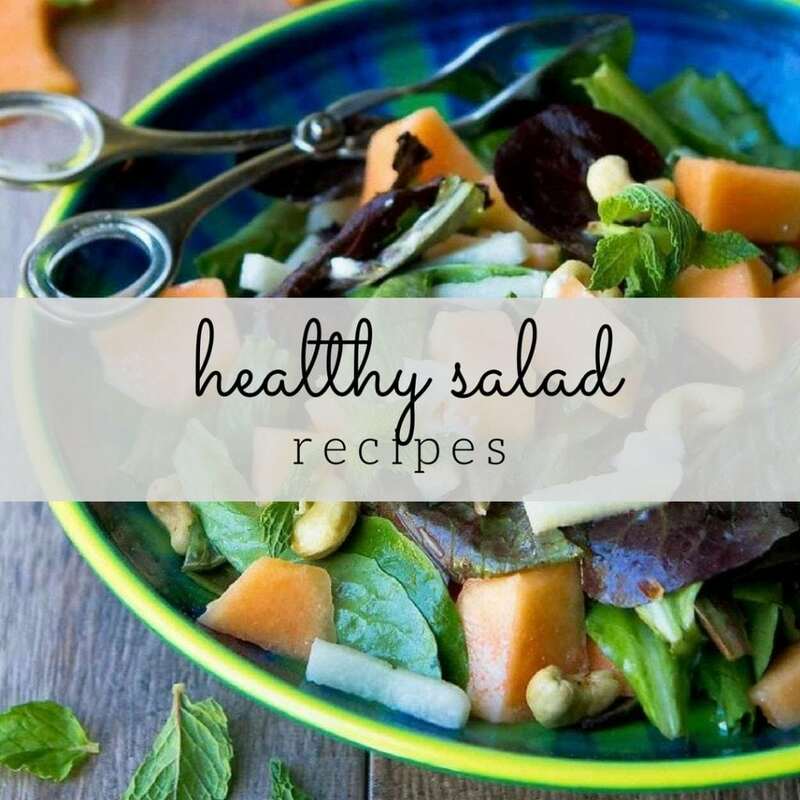 Everyone’s searching for healthy recipes, my readers are emailing in questions and recipe requests and it’s exciting for me to see so many people making a commitment to start on a path towards a healthier lifestyle. I’m always curious to see what types of recipes people are searching for in January and without a doubt, healthy entrees win out over any other type of dish. Not too surprising, really. Whether you’re cooking for one or feeding a small army of children, dinner needs to be served! 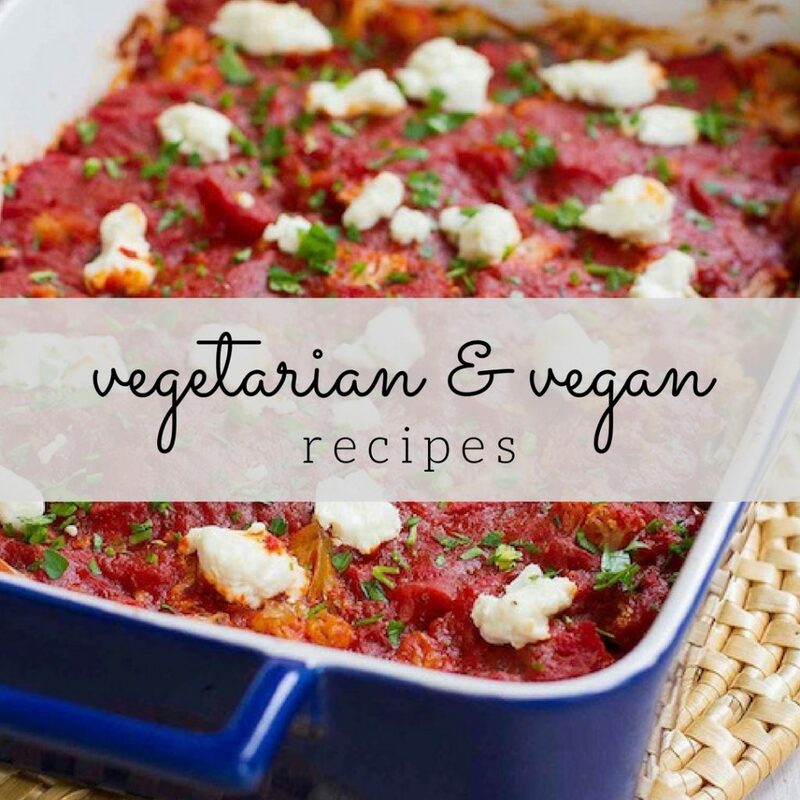 Meatless meals, healthy soups and lean proteins rule the day. But what about those in-between times? You know, that dangerous abyss when lunch has worn off and dinner is still a couple of hours away and suddenly that pack of chips starts sounding like a great option. Ruh roh. If you’re like me, breakfast is a breeze with yogurt parfaits, smoothies, eggs and oatmeal as easy options; lunch is just as simple when you plan on leftovers or a big salad with some lean protein; and you’re killing it at dinner prep because you focus most of your meal prep energy there. If I don’t plan ahead for when the munchies hit, I find myself diving headfirst into the cheese and crackers (my weakness) or staring blankly into the fridge until I start grabbing items that inevitably add up to more than a simple snack. To combat this, I take a trip to the grocery store and load up on healthy options, such as hummus, chopped veggies, raw nuts, apples, peanut butter, yogurt and so on. I focus on all of the O Organics® products available exclusively at my local Safeway store, which are economically reasonable options when shopping for organic ingredients. For this healthy 7-layer dip recipe, I was set on layering in the O Organics guacamole, but couldn’t seem to find it. The customer service manager was so helpful in making sure I walked out of the store with exactly what I needed, which is exactly the same experience I’ve had with several Safeway employees. One of the many reasons I keep going back. This is not your standard 7-layer dip. I used a mixture of southwestern and Mediterranean-inspired ingredients to come up with the perfect combo of flavors and nutrients. When I’m snacking, I always try to combine protein, a few carbs and some healthy fats so that I walk away feeling satisfied. This dip has all of those things. 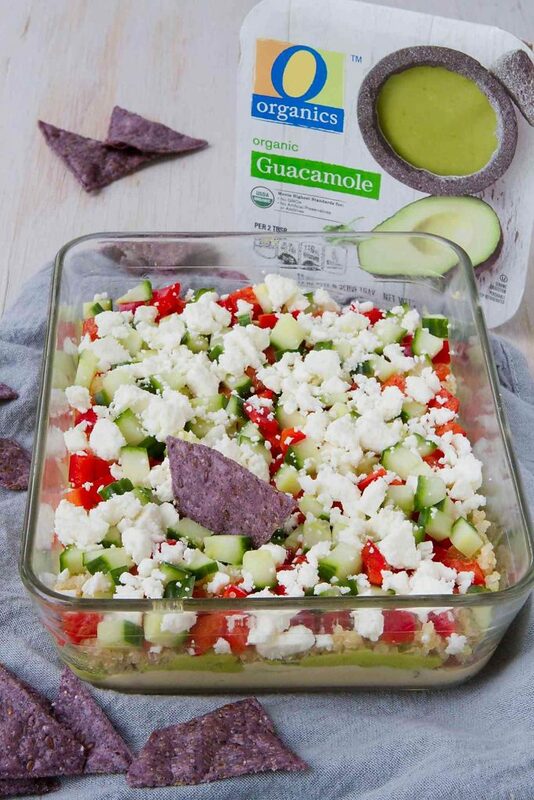 The layers in this dip are hummus, guacamole, quinoa, tomatoes, cucumber, red bell pepper and feta cheese. Plenty of veggies, a good hit of protein, a healthy whole grain and healthy fats. I was tempted to sprinkle in some herbs and spices but, honestly, the flavors in the O Organics hummus and guacamole are so good that it wasn’t necessary. Serve this up a snack time or at your next tailgating party, with some raw veggies, pita chips and tortilla chips for dipping. 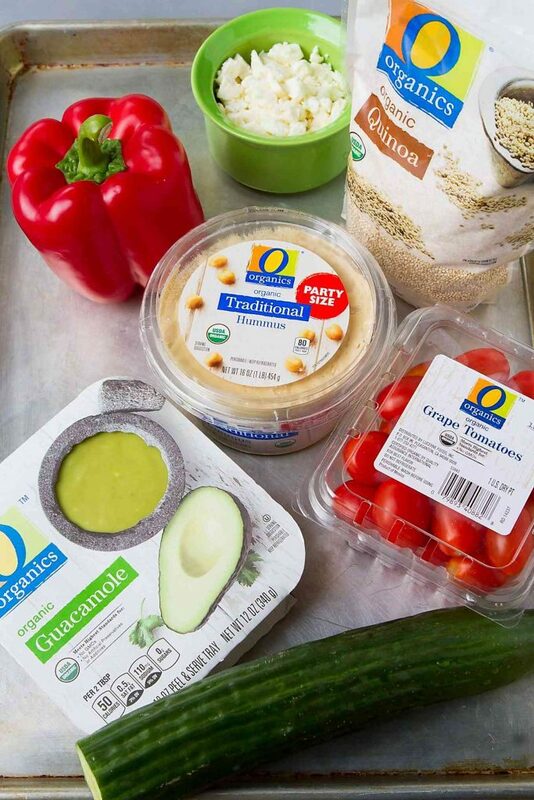 If you don’t have a Safeway or Albertsons in your area, you can find the O Organics products at all Albertsons Companies stores, including ACME, Jewel-Osco, Vons, Pavilions, Randalls, Tom Thumb, Shaw’s, Star Market, United Express, United and Carrs. Spread the hummus on the bottom of a glass baking dish (I used a 9- by 6-inch dish). Sprinkle the diced tomatoes over top of the hummus. Dollop the guacamole on top of the tomatoes and gently spread with a rubber spatula. Squeeze the lime juice over the guacamole. 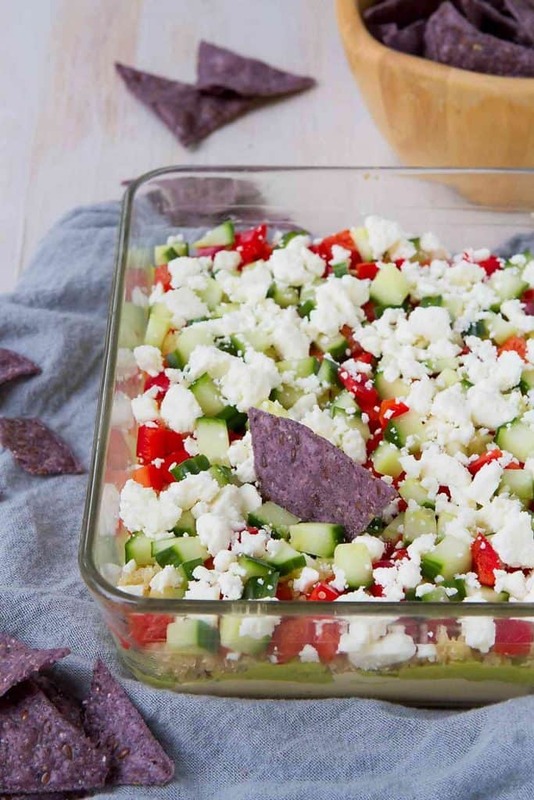 On top of the guacamole, sprinkle the quinoa, then layer the red bell pepper, cucumber and feta. Disclosure: This post is sponsored by Albertsons and Safeway. All opinions are my own. This post contains links to my Amazon affiliate page. Any revenue made from sales through these links helps to support this blog. Thank you! This looks so good! Perfect for game day! Love all the layers!